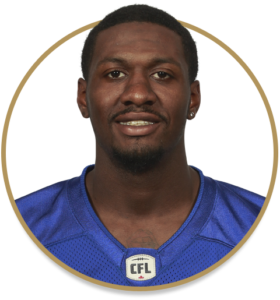 Signed as a free agent on April 19, 2018, Cooper started the season on the practice roster before making his CFL debut in Hamilton on June 29th as a designated import. He made his first start a week later against the B.C. Lions and finished the year with 13 tackles in five games played. Was re-signed by the Bombers on January 16, 2019.
Cooper began at Dean College, where he played in four games as a freshman in 2014. He transferred to Grossmont College in 2015 and played in eight games. He started in nine games as a junior in 2016 after transferring to Dixie State University and in his two years there recorded 61 tackles, one interception, and 17 pass breakups. He was a All-RMAC first-team selection in 2016, and an All-RMAC honourable mention selection in 2017.